The post was shared by State Rep. Judy Reyher (R-Swink), who is already known for sharing racist memes on Facebook. Other commenters stated that Obama is not really a woman, or used images of monkeys. The PERA board also held a meeting yesterday, May 3. According to journalist David Sirota, Stapleton didn’t show up. We don’t know why he wasn’t there, but we do know it was raining all day long. A review of social media indeed reveals a close family that remains united. However, it isn’t the metaphorical family of House Republicans, but rather literal relatives from one particular political family -the Nevilles- attacking other Republicans. Their primary target is Patrick Neville’s nominal partner in House leadership, Assistant Minority Leader Cole Wist. The attacks have been led by Advancing Colorado, a 501(c)4 online entity run by Joe Neville’s consulting firm. On Facebook the group called Wist a “Republican Traitor” who “wants to seize your guns.” It also liked comments calling Wist “treasonous,” a traitor who should be ‘removed by force,’ and a “FK TARD.” Advancing Colorado has posted numerous items over the past two days, many of which include photoshopped images attacking Wist, along with Arapahoe County District Attorney George Brauchler (who is also the Republican candidate for Colorado Attorney General) and Douglas County Sheriff Tony Spurlock. On Tuesday he apparently used his leadership authority to take Wist’s seat on the House Judiciary committee where the bill was assigned to be heard this afternoon. It is unknown if Wist’s removal is temporary. 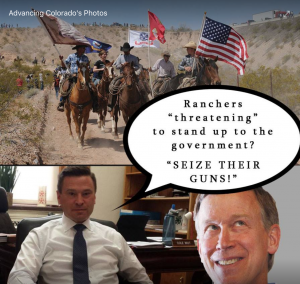 Barb Neville, mother of Patrick and Joe, wife of GOP State Sen. Tim Neville (and manager of the senator’s Facebook page) shared one of Advancing Colorado’s posts. She added her own comment wondering what sort of bribe Wist and other Republicans must have been promised to support the bill. This post was first published on the Colorado Times Recorder. The Colorado Republican Party has deleted and apologized for posting pictures of State Rep. Dominique Jackson (D – Aurora) with her eyes closed at her desk on the statehouse floor. The caption declared Jackson to be “In search of the American Dream,” but it failed to mention her serious health condition: lung clots which require her to receive regular IV infusions of white blood cells. Her condition and the post itself were first reported via Twitter by KRCC radio’s Bente Kirkland. Cole posted the images around 3:00 pm on Monday. Within the hour, several commenters had noted her health condition. Other commenters, however, were less concerned about the Representative’s health. Still others chose to make racially charged statements referencing Africa and calling the Representative as a welfare recipient. Joining in the comment frenzy was El Paso County Republican Chairman Joshua Hosler, who compared Rep. Jackson to 85 year-old Supreme Court Justice Ruth Bader-Ginsburg, who notoriously fell asleep during a State Of The Union speech. None of these comments were removed from the post. Some remained up for eighteen hours, being removed only when Colorado GOP spokesman Cole deleted the post entirely. Daniel Cole was right to apologize and to delete the post. No apology was forthcoming, though, for the dozens of cruel and insulting statements hosted on the state Republican Facebook page for nearly a day. During this time, two new posts appeared on the page. 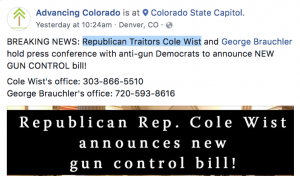 Political Facebook can be a mean place and page administrators like Cole aren’t expected to spend every waking minute scanning their post comments for hate, but personal and racial insults levied at an elected official and colleague of the Colorado GOP’s own members shouldn’t ever be tolerated. This was first published on the Colorado Times Recorder. Alamosa residents decried Councilor David Broyles’ assertion that “Republicans hate poor people,” before calling for his resignation at last night’s city council meeting, which also included a discussion of a possible recall election. 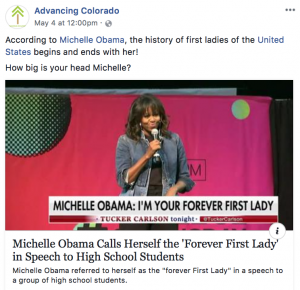 Broyles admitted to being the author of the Alamosa County Republicans’ controversial post on its Facebook page Friday. He has since resigned from his position as Vice Chair of the Alamosa GOP, but remains in his public office as city councilor for Alamosa’s Ward 2. The full city council meeting can be viewed online here. The links in the paragraphs below jump directly to the statements being discussed. It’s unclear who the first-person possessive in this apology is referring to, though it’s suggested in the comments to the original post that Alamosa City Councilor David Broyles is the author. But perhaps it’s better to think of this as, you know, every Alamosa Republican saying sorry. In the fourteen hours since the statement posted, it has been “liked” by two people, but generated opposition from several other commenters, including one who asked for the statement to be taken down. The four officers of the county party are Sandra Wagner, Chairman; David Broyles, Vice Chairman; Valerie Broyles, Secretary; and Patrick Shima, Treasurer. 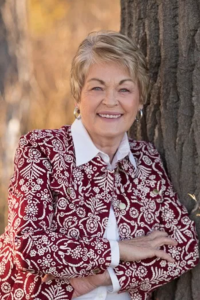 Republicans in Alamosa County include US Congressman Scott Tipton who represents the Third District in part from his office in Alamosa, and State Senator Larry Crowder of SD35, who lives in Alamosa County. This post was originally published on the Colorado Times Recorder. It will be updated with comments from officers and elected officials as received. An email to the county party sent late Friday afternoon was not returned as of Saturday morning. Political candidates routinely stretch the truth. It’s the reason television stations like 9News run election-year segments called “Truth Tests” that fact-check campaign ads. It’s rare, however, for a falsehood or exaggeration to be flagged and corrected right when it happens. That is, of course, unless it happens at a live event. Tuesday evening’s gubernatorial forum, hosted by the Douglas County Republican Women, presented just that opportunity. 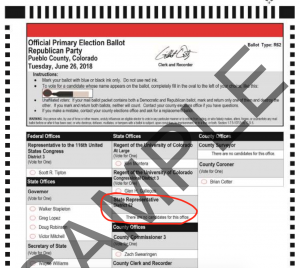 Candidate Walker Stapleton was fact-checked on the spot — by not one but two of his own opponents. Stapleton didn’t attend the Colorado Hispanic Republicans forum on January 17. Former lawmaker Victor Mitchell won that straw poll with former Colorado Trump Campaign official Stephen Barlock coming in second. Mitchell also won a December 17 straw poll held by the Arapahoe County GOP at its annual holiday party. But there’s no need to take a progressive blogger’s word for it. Mitchell and Barlock were sitting right next to Stapleton when he made his false claims and they were more than happy to set him straight. In this video clip, you can watch their reactions as he says it, followed by their direct replies to him. To watch the entire DCRW forum, which was broadcast live on Facebook by the Barlock campaign, click here. This post was first published by the Colorado Times Recorder. Former CD7 Representative, twice-failed GOP gubernatorial candidate, conservative blogger and occasional right-wing radio host Bob Beauprez will interview two powerful members of President Trump’s cabinet: Energy Secretary Rick Perry and Secretary of the Interior Ryan Zinke. No specific topics are listed, but issues such as fracking, the oil & gas industry and public land management are safe bets. If a discussion of federal vs. state responsibility for public land does occur, it’s always possible that Beauprez will reiterate his support for the failed “Northern Colorado” secession movement launched by conservative activists in 2013. It’s also possible that Beauprez will raise his fears of “creeping Sharia” with Secretary Perry, who has been accused by fellow CPAC speaker* Pam Geller of being overly friendly with Texas Muslims. It’s unclear what specific action Michelle Malkin will advocate for during her ten-minute speech, but a review of her past positions and statements reveals some possibilities. She may suggest placing Muslim-Americans in internment camps, which she justified in her 2004 book, “In Defense of Internment: The Case for “Racial Profiling” in World War II and the War on Terror.” She may call for Americans to mock the suicides of prisoners at Guantanamo Bay, as she did in 2006, shocking her interviewer, Bill O’Reilly. Perhaps she’ll pose for selfies with those who believe President Obama was a Nazi, as she did in this picture, taken at the Colorado state capitol in 2009. 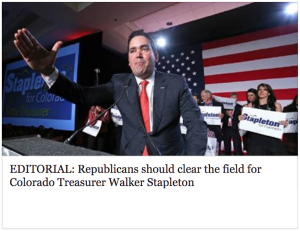 On January 14, the Anschutz-owned Colorado Springs Gazette editorial board told Colorado Republicans: “clear the field“ for gubernatorial hopeful Walker Stapleton. Fellow candidate Tom Tancredo, the primary target of the newspaper’s “step aside” directive, took to the airwaves two days later to reply directly. Meanwhile on Facebook, numerous other Colorado Republican officials and leaders responded to the Gazette’s opinion. On the whole, their reactions can be characterized as less than enthusiastic.